Emboldened after their gains in 2018 — including the closer-than-expected Senate race between U.S. Sen. Ted Cruz and Beto O'Rourke — the state party is establishing a "Cornyn War Room" to "define Cornyn before he defines himself," according to a memo. It is unlike anything the party has done in recent history surrounding a U.S. Senate race, and it reflects the urgency with which Texas Democrats are approaching a potentially pivotal election cycle. "In 2020, we must seize the opportunity to flip Texas," says the memo from the state party, which was obtained by The Texas Tribune. 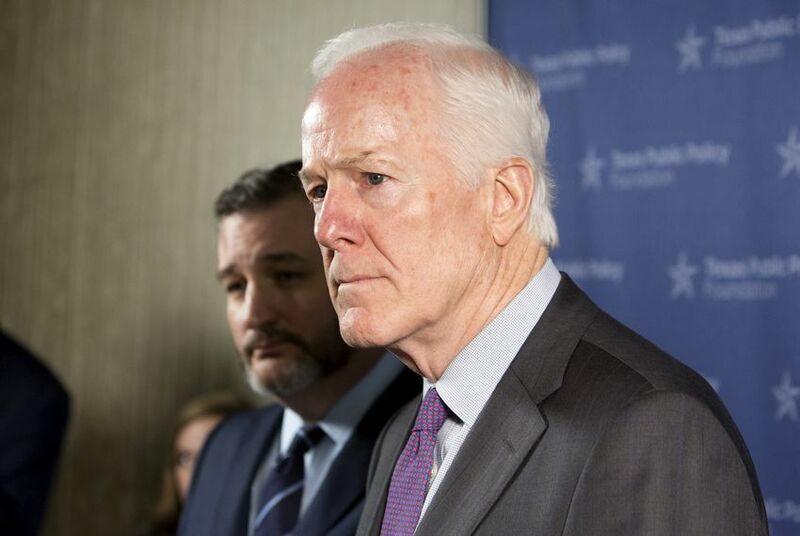 It cites recent polling that found Texas "essentially tied" in the 2020 presidential election and that 64 percent of voters do not know or dislike Cornyn. "We cannot wait for the primary dust to settle before we launch our attacks on John Cornyn." The project, the memo adds, will "define Cornyn and reveal him for what he is — a coward, afraid of shadows on his right and left." The memo says the effort is "funded, in part, by record-breaking fundraising, including the most successful February totals in Texas Democratic Party history." The memo does not specify the figures. Cornyn responded to the initiative Thursday morning on Twitter, saying he hopes Democrats "spend every last penny they get from their out-of-state puppet masters." "Only the Democrat party would praise themselves for doing what should be their job," Cornyn campaign manager John Jackson said in a statement. "Texans won't be fooled by their millions from California and New York." Several prominent Democrats are considering challenging Cornyn, perhaps most notably U.S. Rep. Joaquin Castro of San Antonio and former congressional candidate M.J. Hegar, who said Tuesday she is "taking a very close look" at the race. Three lower-profile Democrats have already declared their candidacies. Cornyn has vowed to be prepared for whatever Democrats have in store for him next year. He has made a number of early staff hires, saved up nearly $6 million for the battle and moved to define Castro as too liberal for the state. Still, Cornyn is aware he will need to make a thorough case for himself as well. He told reporters Wednesday that he "absolutely" intends to reach out to voters who may still not be familiar with him after three terms in the Senate. "One of the great things about the Senate is you run every six years," Cornyn said. "One of the bad things about the Senate is run you every six years. Obviously people have a lot on their plate and aren't paying as much attention as the political class in Washington, D.C., is. I think that's my job, that I need to go, for those people who are unacquainted with my record, to help educate them." "I intend to run a vigorous campaign," he added.